December 8, 2010 (SALISBURY, NC) – When the Salisbury Post asked the local independent bookseller, the Literary Bookpost, to suggest books that would make good Christmas gifts, children’s section director Daphne Safrit included Sleep, Little Child in her top picks. The Literary Bookpost also named Sleep, Little Child as its Picture Book of the Month for December. In September, it was the store’s bestseller and Safrit predicted it would be again during the holiday season. Owen is also running a giveaway contest for a free copy of the book. Directions for how to enter the contest follow the review. The CD is tucked in a pocket in the back cover. Hoffman of Salisbury. Illustrated by Charleston artist Tony Waters, it is a rhyming story in which a father assures his young son that he will sleep safely through the night because his heavenly Father is always watching over him. The book is intended for children from infancy through age seven. 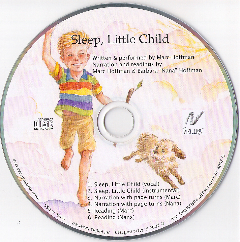 Sleep, Little Child includes a CD tucked in a pocket inside the back cover that features Hoffman performing his original lullaby. Other tracks offer the instrumental-only version, plus two non-musical readings: one by the author and another by the author’s mother, radio personality Barbara Hoffman. Published by Virillion Music, Sleep, Little Child is available at the Literary Bookpost, on the website www.sleeplittlechild.com, and on Amazon. For more information and to hear the lullaby, visit www.sleeplittlechild.com. Synopsis: As babies grow into little children, there comes a time when they realize that, like themselves, Mommy and Daddy sleep at night, too. Where, then, is the watchful eye to look over them all night? Where are the protective arms to keep them safe when they close their eyes and drift away into dreams? “Sleep, Little Child” answers these questions with simple verse, soft music, and compelling illustrations. 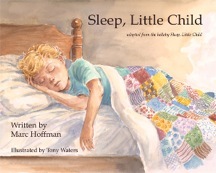 Composed and sung by Marc Hoffman and illustrated by Tony Waters, “Sleep, Little Child” is a lullaby with a comforting message: that Someone strong, loving and more powerful than even Mommy and Daddy is right there with all little children, keeping them safe and warm, and greeting them with the morning light. Publisher: Virillion Music. Retail price: $17.95. www.sleeplittlechild.com.